the most glorious moments of the day! Though I heard (ok, small) crowds singing CPG songs on the street in daylight too!!! not in the backpack, they used - AFAIK - stanadard car batteries. I am more sorry for the driver who will probably sentenced for years to spend in prison. Poor driver, yes. He was beaten badly. But he is a hero anyway. That was the most reflected event that day. And the funniest as well. Why doesn't your video work? How is the driver a hero? He put the lives of dozens of protestors at risk by nearly running them over. Look at how many people had to run out of the way of the tank - if even one of them had been a bit too slow or wasn't paying attention, they would be dead right now. He is very lucky that nobody was killed. Driving a massive tank like that through a crowd is an incredibly dangerous and irresponsible. That was not an idiot but a bandit. He triedsf to run over the police who were on duy. That was not an idiot but a bandit. He tried to run over the police who were on duty. No, he did not try to run over the police. Definitely not! As you can see in the video, he stopped the T34 at the line the riots made of stones. He is not a hero neither a bandit. He did what he thought right in that situation: the police attacked the people in that square whatever had happened before 2 kilometers away. He/They fixed 3 out of 4 protective measurements. Obviously it was a planned action, that did not take care of all problems. What would have happened if he/they had been prepared with extra gasoline, no one knows. We can just speculate, but we know that he/they endangered the lifes of all close to the tank. Does that make him and his friends a hero? Not in my book - just a ruteless extremist who do not care about other peoples lifes. 1. There were no guards at all. It was an open-air exhibition. 2. Yes, there might have been locks. 3. Battery might have been removed. But you should already know that a T34 can be started pneumaticly. (index.hu/politika/belfold/1026t34es/) (in Hungarian) 4. I do not know about the amount of gasoline, but the T34 was stopped by its driver. View the video again. They did not fixed any other military equipments. They pulled them out by their own hands. eyewitness, please check out this article in English (www.caboodle.hu/nc/news/news_archive/single_page/article/11/october_23rd/?tx_ttnews%5Bswords%5D=tank&cHash=1f48fa1511) of which I copy the central part here "József Holló, director of the Institute and Museum of Military History, said the electric wiring of the tank had been removed to prevent a theft before it was put on display at the square. In addition, the tank only contained a small amount of fuel, just enough to drive it up the vehicle that transported it to the commemorations. The perpetrators started the tank because they replaced the wiring and fitted the vehicle with two batteries normally used in cars, he explained. The tank, driven by an elderly man, ran out of fuel after 100 meters." With "guards" I mean people who stand beside the vehicle to help people up an down. Previous years we have had these tanks in district 12 and "guards" were there to check that people did not hurt themselves. Of course the "guards" were not there to stop anyone from stealing the equipment, then no-one thought that would happen. 1. Mr. Holló says what he has to. He is RESPONSIBLE for exhibiting an operable T-34. Thus he has to defend himself. Next time, can i cannon Buda with the guns exhibited in the Castle Area? Of course not. They are idle. 2. People wanted to celebrate the 50th anniversary of the 1956 revolution. They meet in the streets without a police licence and wanted to go to the Kossuth square (at the parliament). Understandable? YES, it is. 3. These people were shot by rubber bullets, tear gas grenades and coloured water cannons. (Again: on the 50th anniversary of 1956 that they wanted to celebrate.) What would you have done in this situ? Moving everything you can against the armed others wearing police uniform without identification numbers. Even an OPERABLE T-34. It my surprise you blame Mr. Hollo, when you guys normally blame the PM for everything. According to this report from 2006-10-13 14:16:00 by CaboodleNews (www.caboodle.hu/nc/news/news_archive/single_page/article/11/tanks_to_be/?tx_ttnews%5Bswords%5D=tank&cHash=5b2680ad24) "The Office of the Hungarian Prime Minister is planning to place tanks and period military trucks in key locations of the revolution of 1956, reports inforadio.hu.". It is rather obvoius for anyone subscribing to conspiracy theories that "it was an important piece of discrediting the peaceful demonstrators". Your term "OPERABLE T-34" is understood that it was possible to drive around the T-34 (after the appropriate startup procedures described above), not to fire its gun etc. 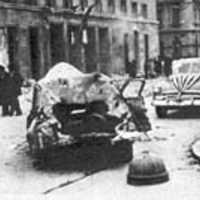 You state that the "demonstrators" did this in the spure of the moment, but to start the T-34 you still need some equipment and that was brought to the scene before, so it was a planned action, not an "heroic defensive action". Most/All of the people actually endangered by this extremeist tank driver were actually fellow rioters/"demonstrators", so maybe he was an undercover MSZP-agent... never thought about that.... maybe he just tried to kill some rioters? Ha? What are you talking about? Blaming Mr. Hollo is not enough for you? Hahah. Try to read more about how a T-34 can be started (if that i linked was not enough) even in very cold Siberian temperature. Try to understand what "pneumatic" means (read my previous comments and links). And i have said in a previous comment that they are no heroes neither bandits. Show me a (wo)man/eyewitness who thought (s)he was in dangeour. The question of how much of driving around the T-34 was pre-planned or not will be settled by a court of law. If it was a planned action the sentence will be more severe. The same thing with the question of putting other peoples life at risk when driving around a T-34 in a crowd. Legally it is never a question if someone felt threatened or not by our "T-34 MotorHead". Just looking at the videos make it clear. I do not belive any court will be impressed by the defence that the T-34 was "OPERABLE". We are all responsible for our actions, regardless if we stumble over an "OPERABLE" T-34 or not. As I stateed earlier, previous years we have had the same or similar T-34s in the 12th district and we never felt the urge to drive them around as "you guys" on the Pestside. The term "you guys" refer to some people, mainly Hungarians, who think that disliking the PM gives "you guys" the right to do anything, like "meet in the streets without a police licence and wanted to go to the Kossuth square" and "driving around a T-34 in a crowd". None of the actions were allowed on October 23rd, 2006. And no - I am not your Prime Minister. "None of the actions were allowed on October 23rd, 2006." Why were meeting in the streets and going to the Kossuth square not allowed on 23rd October on the 50th anniversary of the revolution? Explain it to me! Police-uniform dressed people attack a spontaneous mass - who want to celebrate the anniversary - with guns (the people who live in the Alkotmany street are eyewitnesses, too). Imho, it is the mass right to defend themselves. On next 15th March, will "you guys" attack the people again? Kids, elderly, teachers,...? I assume, there will be spontaneous masses around the country commemorating the 1848 revolution. And what does it mean "mainly Hungarians"? "meeting in the streets" with proper licenses were allowed. I remember Fidesz had a big one outside Astoria. Show me any democracy where "meeting in the streets" are allowed without making agreements with the proper authorities in advance? Kossuth Square was and still is closed. Of course it was correct to close the square during the visit of forreign dignitaries - compare what happens in any democracy of your choice when the G8-circus comes to town. Just because you are a party-goer you do not get the automatic right to trash other people's parties. The legal reasons for keeping Kossuth Square closed for a longer time are discussable. There is an interesting interview with the departing head of the Hungarian Helsinki Committe (hvg.hu/english/20061109_koszeg_ferenc_helsinki_committee.aspx). I would expect that October 23rd will be a riot day in Budapest for the years to come, like November 30th in Stockholm or May 1st in Berlin. Over the coming years any remaining public support for the rioters will dvindle. It will be interesting to see how a future Fidesz government will handle this kind of disturbances. Do you really think there would have been any difference if Istvan Tarlos would have won the Budapest election? It is still the Budapest Police who is responsible for the order in Budapest, not the Government. "Mainly Hungarians" means a majority of Hungarian nationals (= passportholders) and people from the rest of the world, ethnical Hungarians or not. One of my right-extremist friends overheard some skinheads speaking what he recognized as Slovakian in front of the police during a stand-off with the police. My interpretation is that they were Slovak HVIM-guys. We finally agreed that they were "stupid short-haired tourists who ended up in the wrong street corner". So, what about 15th March? Will i need a "license" from the police if i want to commemorate with my class? Foreign dignitaries had left the Kossuth square before noon. The "you guys" wanted to enter the square aroud 3pm. Then? Slovak HVIM-guys? Are you crazy? What do you know about history of Hungary or Slovakia? After the storming of the TV-house the right-extremist have concentrated their forces to Budapest, because they wanted a venue with a lot of international media attention. Not only politically motivated people came to Budapest in September/October, you have the mentally disturbed English lady who the Police arrested at Kossuth Square carrying knifes in her bag. She had arrived to Hungary "to bring down the Government". Not everyone on the streets of Budapest have had noble motives. I would belive that if you and your class plan to disrupt traffic, like walk in the middle of the street or the event is expected to consist of a greater number of people (which in itself would/could create traffic problems), and similar, you would need a license from the local authorities. The police need to plan to divert traffic etc. To get an exact answer to your question I would recommend you to contact the Budapest police. This is normal procedure in any democratic country I have visited. The question of the long-term closure of Kossuth Square I answered in my earlier post. I was standing on the tank in question and filming with my video camera. The hatch of the tank was locked with a largish padlock. Suddenly I noticed a man with a large, cubic rock in his hands, trying to break the lock. The rock looked like those used in the interface of streets and sidewalks. I jumped off the tank. I did not get the breaking of the lock on tape, but in a few seconds I saw the man enter the tank, which I have on video. He had a backbag with him, but it did not seem big enough to me to contain a car battery. I left the scene at 5:40 pm (I remember checking the time just minutes before that, and it was 5:38), because the tear gas was starting to hurt my eyes. I estimate that the breaking of the hatch lock took place some 5-10 minutes before that, i.e. around 5:30 - 5:35 pm. On my video, I can see that it was slowly starting to get dark. Comparing the amount of light to the videos featuring the tank moving, I would say the driver managed to start the tank no more than half an hour after my leaving (I guess someone has the exact time?). I don't know if that would be enough time to install new wiring etc. My personal impression was that taking the tank was a spontaneous act. Before that, the demonstrators had seized an armored car (which was parked next to the tank) and pushed it into the crowd and towards the police line (apparently not managing to start the engine). So maybe then someone thought, why not try to seize the tank, too? 1. HVIM has "popular support in Slovakia" but they are Hungarians and not Slovaks, i believe. I suggest you again: LEARN HUNGARIAN HISTORY!!! 2. What does it mean "you and your class"??? I do not know what "class" are you from. Tell me. And what class i am from, pls tell me! sorry, i have to correct myself. "History is the hitory of class struggles" Marx. Did you meant it?